One of the most profound transformations in postsecondary education is coming from the realization that digital communication skills really do matter in everyday life; therefore, it is imperative that digital skills also matter in academic life. Students and enlightened faculty alike understand that the convergence of technical and creative competencies is helping to create new opportunities for a whole new generation of creative professionals. "Imagine a curriculum that is based on achieving comprehensive goals where students must create and produce a computer game," suggests Eric Converse, CEO of ATIV Software, a mobile application development company. "This requires an understanding of physics and math, programming and scripting, story and dialog writing, cinematography, art and design, music, collaboration, teamwork, and delegation." Digital storytelling has become an essential method of enhancing education in the humanities by making abstract or conceptual content more understandable. It engages students through images, audio, and video and provides a compelling way of sharing their work with their peers that, in turn, fosters more collaboration and accomplishment. 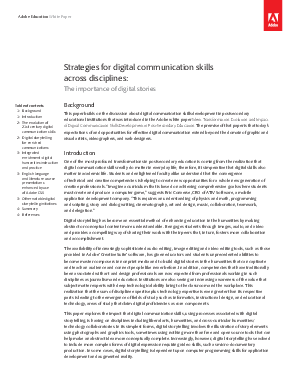 This paper explores the impact that digital communication skills, using processes associated with digital storytelling, is having on disciplines including liberal arts, humanities, and cross-curricular humanities/technology collaboratories. In its simplest forms, digital storytelling involves the illustration of story elements using photographs and graphics tools, sometimes using nothing more than free and open source tools that can help make an abstract idea more conceptually complete. Increasingly, however, digital storytelling has evolved to include more complex forms of digital expression requiring video skills, such as micro-documentary production. In some cases, digital storytelling is dependent upon computer programming skills for application development and augmented reality.